Limitless [fostul Dark Fields] este un thriller de actiune regizat de Neil Burger, cu Bradley Cooper, Abbie Cornish si Robert De Niro in rolurile principale. Viata unui scriitor amator se schimba complet dupa ce ia un medicament top-secret care ii permite sa foloseasca 100% din creierul sau si sa devina o versiune perfecta a lui. Noile lui abilitati nu ii vor aduce insa numai beneficii luxoase, in acest film provocator! 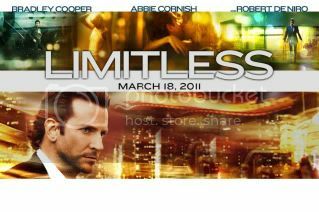 Limitless are premiera pe 18 martie 2011. Murder on the Orient Express: trailer! Hi there, I simply wished to tell you, I disagree. Your own post doesn’t make any sense. Of course Amado, the Internet is all about sharing information. If you decide to publish it somewhere please link or give credit to seriousrunning.com. Thanks for stopping by and Im glad it was informative. Cheaters never win, the fastest runners do. Good luck with your local marathon! Hi there! Solve you get proviso they make a few plugins to avoid with Search Engine Optimization? I’m irritating to get my blog to rank in support of some embattled keywords but I’m not as vastly clear domino effect. Condition you get of any entertain let somebody in on. Thanks! It is very tough to locate an excellent web page. And I consider I am lucky adequate to have come here. The posts are executing fantastic and full of great insights. I might be glad to help keep on coming back right here to examine for updates!